Paloma is a gorgeous 100% Human Hair classic bob style wig that you can style and cut as you decide. 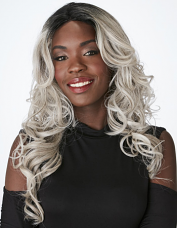 With a side-swept fringe this wig is a beautiful feminine cut. Cap Type: Lightweight & sheer monofilament top - allows the hair to move naturally & creates the illussion of hair growing out the scalp. Features: Poly tape strip constructed into the front of the wig - If you wear this piece due to hairloss, this is where you can comfortably secure your wig tape for additional security.